Those of you who follow me on twitter will know that my writing partner, Jim Eaton and I have been working on a new short film over the past couple of months. Well here it is. The Mad Tree is our homage to the ghost stories of M. R. James, with a little bit of our own silliness plugged in for good measure. It is the story of Mr Darcy Woodwind, a writer from London who falls afoul of a malevolent shrub. No real departure from our usual brand of daftness then. The film is our latest attempt to inflict ourselves upon the 2 Days Later Horror festival. It’s the 10th anniversary of the event so it’d be really lovely if we get picked for the screening. I shall keep you posted on how things go. As is often the way the edit was a total pain in the bum and after blowing a firewire port and having to run all over London, searching for someone who could capture the footage, I finally wrapped the edit up at 6AM the following morning. As a reward we’ve taken this week off from writing but we’ll be back into it after the weekend. The subject of the new project…radio. More soon. As a final side note. It’s worth mentioning that Jack Gavin (who plays the lead role in this film as well as several of our other projects) is getting married today. Our best Bunker wishes to him and his lovely wife-to-be. The much mocked (mainly by us) Ragnarok Dawn was Steve and I’s first attempt at making a film together and pretty much the first project we ever did. It’s from the 2 Days Later competition 2008 and is about a group of Vikings who get lost in a haunted wood and have to fight zombies. If you don’t totally understand some bits of the story then that’s fine because I don’t either and I co-wrote it. That part aside though it does feature some fantastic make-up by Ali Reith and some very cool fight scenes by the talent team of Viking reenactors that offered to be involved. You also get to see Steve stab me in the head, which has got to be worth something. The trailer however is awesome. 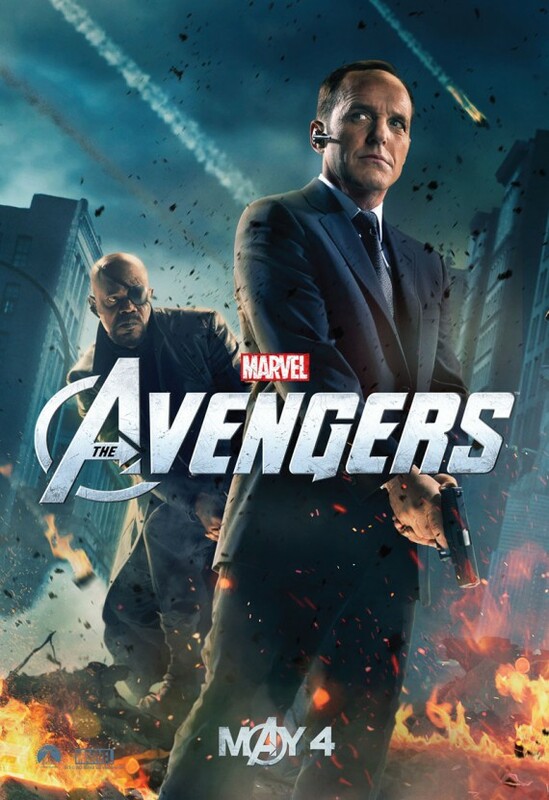 A perhaps unsurprising character that was both invented as a dramatic link between the Avengers canon of films and has found popularity as a result of them is Agent Coulson – played by Clark Gregg – earning himself a series of comedy shorts and his own Avengers Posters. Gregg has played Coulson beautifully, a light touch among gods and super soldiers. Deliberately every-man in nature his capacity is limited to that of a well trained us. We love him and he is perhaps the most well loved of all the Avengers characters. Representing far better the people the Avengers defend, Coulson represents brilliantly the Marvel Universe invented by Stan Lee in 1961 more than 50 years ago. If you follow me on twitter then you’ll already know some of this, but I wanted to wait until the official press release was out before talking about it too much. 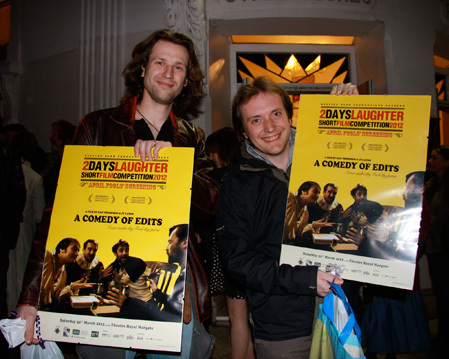 Last weekend Jim Eaton and I took our new film “A Comedy of Edits” to the 2 Days Laughter Short Film Competition in Kent. We liked the sketch but it was a really strong field this year so we weren’t really expecting to walk away with any awards, turns out we were a little wrong about that. Me (left) and Jim Eaton (right) with our awards. The film ended up winning Best Screenplay and Best Film as well as picking up a nomination for Best Director. It’s our second Best Screenplay prize (our script for The Devil’s Fork won in 2010) but we have never managed to bag the coveted Best Film prize until now. The judging panel includes BAFTA award winning actress Brenda Bleythn, BBC Television and Radio comedy writer/presenter Jon Holmes, and Time Out comedy editor Ben Wilson, so it’s a really nice bunch of people to be given the nod by. The night was tinged with sadness however as we learned that this could be the very last 2 Days Competition. Creative England (the body that replaced the UK Film Council) has withdrawn funding from the project (as well as pretty much all film projects in Kent) and unless the Council agree to pick up the slack, this week will mark the final time that 2 Days Laughter and its sister festival 2 Days Later run. It’s a very sad end for a competition that has has generated over 650 films and worked with over 3000 film makers since 2003. I honestly can’t express how much of our current work (possibly even Moon itself) owes its existence to 2DL and to see it become a casualty of the current war on arts is pretty infuriating. We can only hope that Beeping Bush are able to find a way to continue their great work in some fashion going forwards. The good news is that while this may be the end of 2DL, it is most certainly not the end of mine and Jim’s film making partnership. We’re meeting up in a week or so to look into new festivals and places to create work for and I have a feeling that the best stuff is yet to come. So, I guess the only other thing to do is to introduce you (or reintroduce you) to the “award winning” sketch: A Comedy of Edits. Hope you enjoy and as always, thanks for the support! This is the final cut of the new film that James Eaton, Paul Wade and I have been working on, it’s also our entry for this year’s 2 Days Laughter Competition. Those of you who’ve followed us for a while will already have heard of 2DL as we do it pretty much every year but for the uninitiated, 2DL is a film making competition which challenges people to produce a 5 minute comedy film with a total production time of no more than 48 hours. Previous efforts on our part have included youth TV spoof [Box] Fresh, Edd The Duck biopic Ducking The Past and our take on the BBC’s Springwatch as well as several other films produced for 2DL’s horror based sister competition, 2 Day’s Later. We’ve managed to score a shortlisting on every film we’ve put in so far as well as one or two awards, fingers shall remain crossed that our new baby fairs equally well. A Comedy of Edits is the story of William Shakespeare’s meeting with his play’s financial backers and stars Joshua Broadstone and Jack Gavin (of Devil’s Fork fame) as well as Ryan Brannon (one half of comedy duo, Cold Callers). They’re all good friends and it was lovely to get a chance to work with them all again. It was written and directed by James and myself and expertly shot by Paul (who also did the post production and very cool titles). I shall keep you updated on how the competition goes, but for now I hope you enjoy the film.